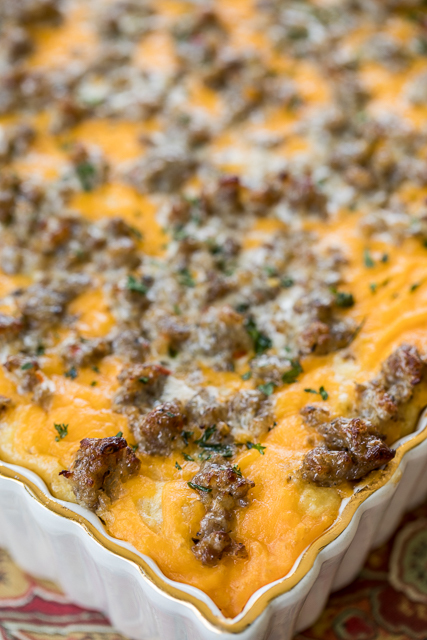 This Sausage and Ranch Grits Casserole is perfect for Christmas morning! You can make this ahead of time and pop it in the oven when you are ready to eat breakfast. I like to put it in the oven when we start opening presents so it is ready when we are done with the morning fun. All you need are some biscuits and some fruit and you are set! 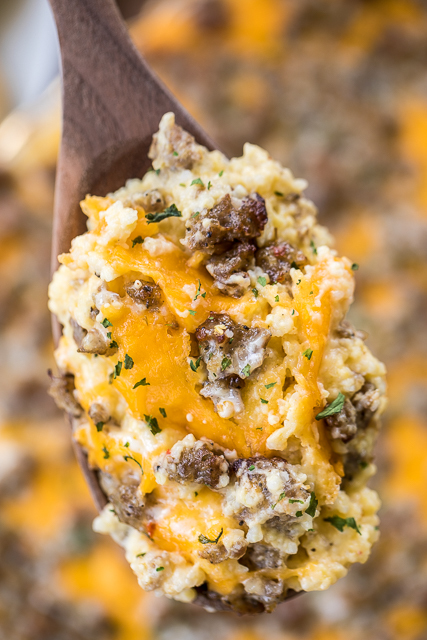 This Sausage and Ranch Grits Casserole is not only easy to make, it is CRAZY delicious! It has my favorite flavor combination - sausage, ranch and cheddar cheese. SO good! I could eat this every morning. 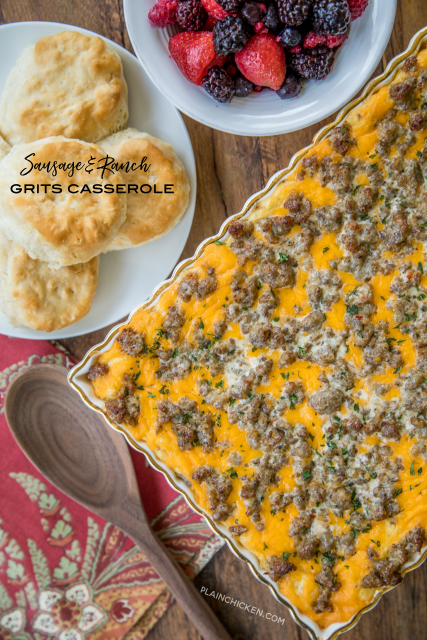 While this Sausage and Ranch Grits Casserole is perfect for breakfast, it is also great for lunch or dinner. It is makes a ton, so it is good for potlucks too. If you don't need the whole recipe, you can split the casserole between two pans and freeze one for later. I am a big fan of recipes that can be frozen for later. In a large saucepan, cook sausage over medium heat until no longer pink. Drain fat. Combine cooked sausage and ranch dressing. Set aside. In a large saucepan, add chicken stock; bring to a boil. Slowly stir in grits. Reduce heat to medium-low; cook, covered, 5 to 7 minutes or until thickened, stirring occasionally. Remove from heat. Add Velveeta cheese and butter; stir until melted. Stir in milk. Slowly stir in eggs until blended. Stir in 3/4 of sausage and ranch mixture. Transfer grits to prepared dish. Sprinkle with shredded cheese and remaining sausage mixture. Love your casserole dish! Can you give the source?